Note: I have to offer a word of apology here. I wrote today's blog yesterday but for some reason it didn't post. I came to write tomorrow's only to discover this fact. Sorry to any one who is reading along. Perhaps It was because I posted the a swear word (In Greek), the same one that St. Paul used in the second reading. Why the first reading? It doesn't seem to fit. It is a reminder of the Glory of God and that the Lord can neither be tricked nor defeated. The Orthodox Christians don't see salvation as making it through the court system of God's love. They are much more finely tuned to believe their salvation is in the resurrection of the dead and the life of the world to come. For them it is not about what crimes/sins they have committed and whether it is reconciled correctly, but rather a focus on conforming oneself to Jesus in Spirit and Flesh, and as St. Paul says conforming to the death of Christ that he might also conform to the Resurrection (As Martha discovered for us, Jesus IS the Resurrection). 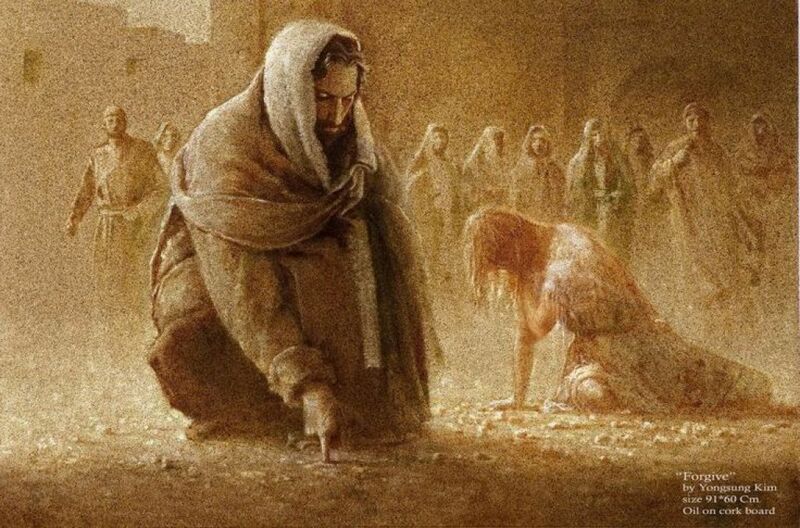 The Adulterous Woman - Caught in the Act - Jesus does not condemn her. What's fascinating is that her soul didn't matter to the priests who brought her to Jesus, she was the object of the story, not the subject. They had no love her, they had no real hatred for her, they wanted to get Jesus at all costs and so she was supposed to take him down. It was a test to entrap Jesus. If you think this was just in Jesus' time, just watch our politicians do this all the time. We say, Aha! see, this means this, or this means that. Find a crack of division and widen it so that you have an enemy on one said and a friend on your side. Jesus sent them packing because he knew them to be cowards. They profess their own righteousness but they don't dare lay claim to it perfectly lest they be seen as a hypocrite, a liar, and full of vainglory. The oldest walked away first for a reason. We should neither presume God's wrath on others, nor should we presume God's forgiveness. We are responsible for ourselves first, and it is best to be sure that our sins are properly reconciled with God. However, we ought to give heed to our Orthodox brothers and sisters and understand this as a minimum. We must conform our lives to that of Christ's. These were not all the points, but I'd say good enough. Sorry for the technical glitch here.